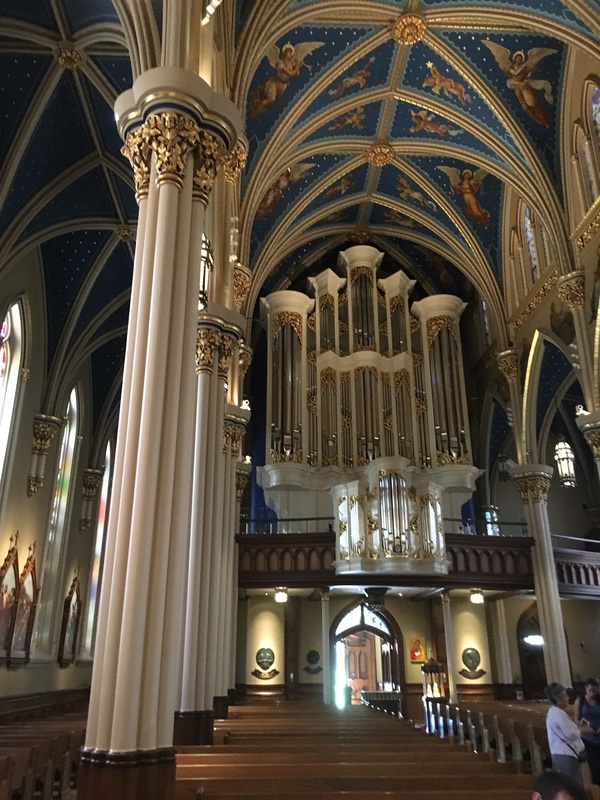 Notre Dame – Let's Go RVing! The clock alarm sounded at 5:00 and I jumped out of bed, tried to turn it off and then jumped into the shower. Obviously I didn’t turn it off as I heard it sounding again. Jerry had never heard it. Guess he was pretty tired. Our plan was to go visit Notre Dame today since South Bend was only 20 miles away but as always our plans have a way of changing. When the tech came he said he should be through by 9:30 so if was the case we could go on to Archbold which was our initial plan. When our coach arrived I could call the campground and see if could get the space we canceled yesterday! Change of plans – again! They called and moved the time to 10:00 when we were on our way over to Building 16 to pay the bill and pick up the coach. When we got there and were talking to the technician we showed him some additional problems with the slides. There was a gap in the kitchen slide making the paint not align correctly. We also opened the living slide and he heard “the knock” so said he would check that. Knowing that would take a while we headed out to South Bend and Notre Dame arriving around 11:30. Despite very low spirits (another story about problems with the house that we are supposed to selling on August 4) we trudged on. Finding a parking place at Notre Dame was almost impossible but we continue to persevere. We rode all over the campus and couldn’t find anything but we did get a good look at most of the campus. By this time we were running very low on gas so we headed to a gas station a mile away. We never did find it but found another where Jerry put in 14 gallons of gas. We have a 15 gallon tank! Whew! We went back to the campus and I guess since it was lunch time some people had left so we were finally able to find a space in the Bookstore parking lot. We walked over to the building that scheduled the tours and signed up for the 1:00 tour. With a few minutes to spare we located a little restaurant on campus, the Au Bon Pan and had a sandwich. 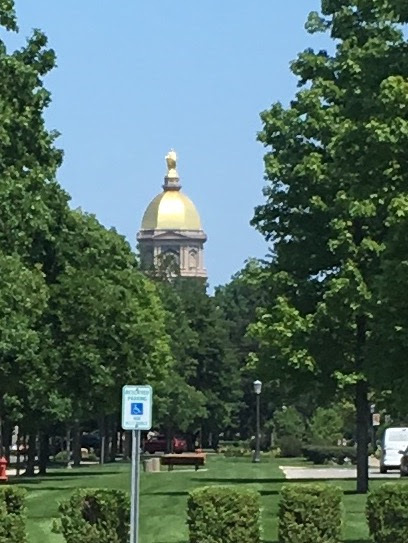 I’m not sure how far we walked on the tour but we covered a lot of the campus, including the beautiful Basilica and the domed Administrative building, two of the most spectacular buildings on campus. The have 31 dorms, 15 for women who were only admitted in 1972 and 16 for men. Each dorm has a chapel. In addition Mass is said twice a day. There is also a grotto where students can go for prayer. It is a beautiful campus with all of the buildings being architecturally consistent in the gothic style. Only two buildings are built out of a different brick. Without a doubt Jerry and I both agreed that it is the most spectacular campus we’ve ever been on. After the tour we headed back to Newmar spent from the heat and the stress of the house. We read for a while and had a great dinner – barbecued pork chops, peas, corn on the cob, stewed potatoes, cucumbers, beets and green beans. It feels good to be eating home cooking again. Eating out can get old after a while! Jim and Jan Hollis have started a go to meeting occurring on Wednesday nights for fellow Christians. Jim will be delivering a short message and then all of the members will discuss it. Tonight was the first night and since I didn’t have a wireless network and I was not going to sit in the Starbucks in the grocery store I tried it on my iPad. Actually I think mine worked better than everyone else’s except Jim. It was a very good session and I look forward to Wednesday nights. Since we are traveling so much we are missing a lot of church so this helps fill the gap.